The digital advertising supply chain is both vibrant and complex. In 2014, almost $50 billion was invested in digital advertising across more than a million sites, involving hundreds of technology vendors. Criminals have inserted themselves into the supply chain, deceiving and defrauding all legitimate industry participants. Rooting out illegal activity will require a common framework to help buyers know which sellers to trust and to allow sellers to demonstrate their ability to meet advertisers’ needs. All industry participants should know more about their suppliers and their suppliers’ suppliers. TAG helps all participants gain a better understanding of the digital supply chain and the challenges that threaten its continued success. We work to build openness, understanding and trust at all levels. Our initiatives aim to make it easier for honest participants to stand out through their voluntary adherence to industry standards and best practices. 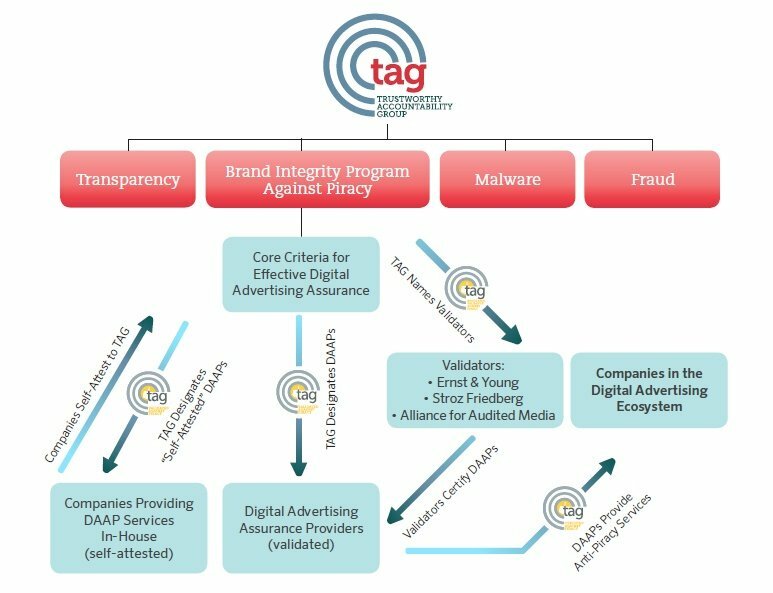 TAG supports the development of common standards to combat digital ad fraud, malware, and piracy in the digital advertising supply chain. TAG will promote the adoption of those standards throughout the industry. TAG’s work in this area is coordinated through the TAG Business Transparency Committee, which works through the Evolved Guidelines Working Group. The Registration Working Group creates greater transparency throughout the digital supply chain through initiatives that help responsible companies know their partners and empower the companies to track payments so that ad revenue is not flowing to criminal networks. The Evolved Guidelines Working Group updates and strengthens TAG’s Inventory Quality Guidelines (IQG) program, which aims to reduce friction and foster an environment of trust in the marketplace by providing a common framework to describe and disclose the characteristics of advertising inventory.